Action-packed aerial sequences highlight this heroic tale of one man's effort to thwart a gang of saboteurs. A scientist carrying the secret to a new high-powered explosive must be safely escorted to Washington and ace pilot Bob "Three Star" Halsey (Lyle Talbot) is the best man for the job. Moments before takeoff, crooks take control of the flight and steal the formula. Halsey watches helplessly from the ground as the plane goes down in flames and the thieves escape by parachute. His sweetheart Judy, whose brother was also aboard, races to the crash site, only to be kidnapped by the villains. Halsey and his co-pilot Wings risk everything to save her, calling on their world-class flying skills in the film's terrifying finale. 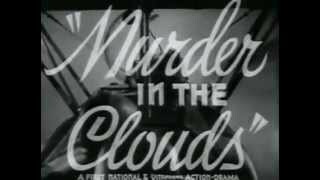 Murder in the Clouds features death-defying stunt flying so impressive First National Pictures would end up re-using the footage in many subsequent films. Bob "Three Star" Halsey (Lyle Talbot) finds himself in a high-flying, precarious position. Lucky for him, he's a crack pilot and up to any aerial task. A scientist carrying the secret to a weapon loses the formula to thieves who crash his plane and parachute to escape. Bob's girl Judy (Ann Dvorak) runs to the crash site to look for her brother, who also was on board, but winds up being kidnapped by the thieves! It's up to Bob and his co-pilot Wings (George Cooper) to save Judy and recover the formula before disaster strikes! Interestingly, the aerial stunts in this film were so impressive for their time that the studio reused the footage in later films. Not much of plot. Not much in the way of great acting. But, oh brother, do I love to watch those old planes do their stuff! I'll watch it again just to see those birds fly!